This may be a duplicate post. I tried posting a few minutes ago, but it didn't show up so I'm trying again . . . I just moved to Webroot AV a few days ago. It's loaded on a Windows 7 desktop computer with a hard-wired modem (no router, no wi-fi), I'm the only one that has access to the computer, and everything was fine with the initial install. This morning I went to look at the Program files in C: drive (WRSA.exe), but could not open the files. I made sure any of the 'protect against process termination' or 'protect against process tampering' etc. options were unchecked in the Webroot dashboard. I went back to WRSA.exe and tried 'Run as Administrator', went to Properties ---> Security ---> and made sure 'Full control' access was enabled, but nothing worked. 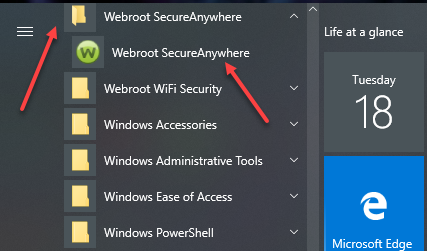 At that point I uninstalled Webroot from the computer and reinstalled it. This time I unchecked the self-defense box (can't remember the exact wording) that's located under 'Installation Options' when loading the software. I cleared cookies and cache, then shut down the computer for a couple of hours. Fired up the computer with the modem unplugged (read: no Internet access), went through all the steps outlined above but still could not access the WRSA.exe files. It's going from bad to worse. Now I don't even have access to the settings dashbord via the icon that was in the Notification Area of the taskbar. The only way I can see Webroot is there is if I right click a folder or file and select 'Scan with Webroot'. Then it starts scanning. Can someone please let me know why there's no longer access to the settings dashboard? Sorry to hear you are having all these issues. Would you follow these exact instructions to uninstall/reinstall Webroot. Also did you Deactivate Webroot on other system before transferring Webroot? Please follow the steps closely! Please let us know if that resolves your issue? I simply wanted to see what's installed on my computer in the WRSA.exe just as I do with every single software program or application that's added to my computer...went through all the steps outlined above but still could not access the WRSA.exe files. I would have thought this was a very good thing, as viewing and even potentially editing an AV's exe file is just the kind of malicious activity I would want a respectable AV product to protect my machine against. I'm just asking why would want to access that file? To start WSA? You can create a desktop icon if you want to start it up if it's not running or if you shut it down for whatever reason. Also what OS are you running? I have Windows 10 and you can start WSA from the start screen. There's no problem accessing WSA. I simply wanted to see what's installed on my computer in the WRSA.exe just as I do with every single software program or application that's added to my computer. I'm not planning on deleting WSA, but also wanted to see if there were amy hidden files or automatic updaters that would need to be deleted manually. When I removed Kaspersky a few days ago, I had to go find their update_launcher.exe and Kaspersky_Upgrade_Launcher in the task scheduler to delete them manually in addition to deleting the contents in the Program Files (x86) folder. I was with Kaspersky for at least 8 years (yes, I stayed even after the DoD warning), prior to switching to WSA a few days ago and I'm hoping to be with WSA for at least that long. I'm just trying to feel my way around to see how things with WSA work. That's all. Maybe, your Webroot Firewall (or other) Advanced Setting is not as default. I've had similiar sounding Webroot alert for .bat string on boot-up while testing Webroot Advanced Settings. I've reproduced .bat sting alert while testing Webroot Advanced Settings not at default. I've tested Allow & Block on my .bat string alert. Your report sounds similiar to my observation. Thanks for the info - everything seems to be fine since that one instance. I started the computer this morning and everything seems back to normal. I'm not sure if it was the cause, but yesterday on boot-up for some reason WR asked if I wanted to block a specific file along the lines of "windowssystem32anc56-09cHy-*****-*****.bat" (obviously I'm making up the string). I thought that was pretty funny because I have no idea whether or not I need that file - that's what Webroot was supposed to tell me. Anyway, I didn't know whether to allow or block so WR decided to block it and I think that might have been part of the problem. @wravmay I ask why are you trying to access WRSA.exe? There's nothing in there that you should be touching? You're kidding, right? I'm trying to access the file because it's on my computer! So you're telling me I can't open that WRSA.exe file? But thanks for the screenshot. @wrav may I ask why are you trying to access WRSA.exe? There's nothing in there that you should be touching? If your having issues please follow what Sherry posted above and if you continue to have issues please Submit a Support Ticket and they can help you sort it out.